This photo is a hint for the next recipe to come! Why is this called curd? I would like someone out there to tell me, because, by ingredients and method, it should rightly be called something waaaay more attractive, like, say, lemon custard. Seriously. Curd? If you’ve ever spooned delicious, bright, lemony curd straight into your mouth from a pan or even a store-bought jar, I am not talking to you. You are excused. But, hey, you out there still reeling from the words lemon and curd together: Come over here close and repeat after me: “It is really lemon custard. Fresh lemon CUSTARD. And it only takes a few minutes to make. I will try this!” Let’s go. Grate the zest off of your lemons and ignore the photo of me using my zester. Even after I chopped the pieces with a big knife, the lemon zest was rather big and there were hurtful comments about same from my recipe testers. Sniff. Juice the lemons and strain out the seeds. Cut your butter up into cubes and set aside, back in the refrigerator. In a small bowl, whisk together your lemon juice and eggs. Add in the rest of your ingredients, except the butter. Still whisking constantly, cook the mixture in a saucepan over a medium heat until it thickens. Add in the butter and mix thoroughly, simmering for a further minute or two. Your lemon curd, or custard, is now done! Spoon it straight into your mouth (let it cool a little, silly) or await further instructions as I have two recipes coming up, starting Sunday, that will use that lovely lemon curd. I mean, custard. If you aren’t using it within a couple of hours, cover with cling film and refrigerate. Lemon curd recipe originally from Delia Smith's How to Cook Book 1. I've entered this lemon curd recipe in Tea Time Treats for January, where the theme is citrus. The hosts are Karen from Lavender and Lovage and Kate from What Kate Bakes. If you have a citrusy item to add, just click on Lavender and Lovage or the photo caption below. I love lemon curd and can't wait to see what recipes you make with it. I made some a few days ago in my Vitamix and it is so good. Might post it coming up in the next week or so. My mother-in-law always uses the microwave but the Vitamix made it even easier. I've been eating it by the spoonful! I was JUST thinking this morning that I needed to learn to make lemon curd for some scones I was going to make and also a donut recipe I had - now I can! thanks!! Thanks, Holly! It's like sunshine on a spoon! Any ideas why it's called curd, Rebecca? I do believe it is a British thing that many Americans haven't even heard of before. I loves me some lemon curd. And pastry cream - which sounds more elegant than anything with the word "curd" in it. Especially when in desserts. Cheese curds, for example, are perfection on poutine, but you wouldn't serve poutine at a tea party, so it's acceptable. I'm not sure where I'm going with this... I guess I'll have to keep loving lemon curd despite it's dodgy name. LOVE lemons this time of year! So fresh and 'springy'! You go wherever you want to with that, Rachael, and I will happily go with you. :) Somehow curds when we are talking about cheese don't sound so offensive. Sweet curds, on the other hand... I just don't know. Me too, Serena! And I like to think the vitamin C helps keep us healthier during the colder weather. Win-win! Thank you, Karen! I debated about which citrus recipe I would share since I've had several just in the last two weeks, but since two of them used the lemon curd, I decided it was better to start at the beginning. I am delighted to be included in this month's Tea Time Treats! I'm totally using this recipe for the pavlova I am making this weekend. I found some great Meyer lemons at the store last night! 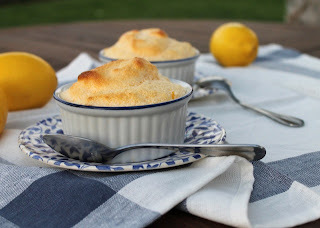 You are going to LOVE it with Meyer lemons, Kelli! If you have a microplane, zest the lemons with that. The finer pieces make a smoother curd, I mean, custard.